The CEO called it a fraud last year but tells CNBC he finds no satisfaction in prices dropping 80 percent from the peak. Bitcoin is trading around $3,570 after skyrocketing to almost $20,000 at the end of 2017. Still, Dimon and other Wall Street CEOs have advocated for cryptocurrencies' underlying technology, blockchain. 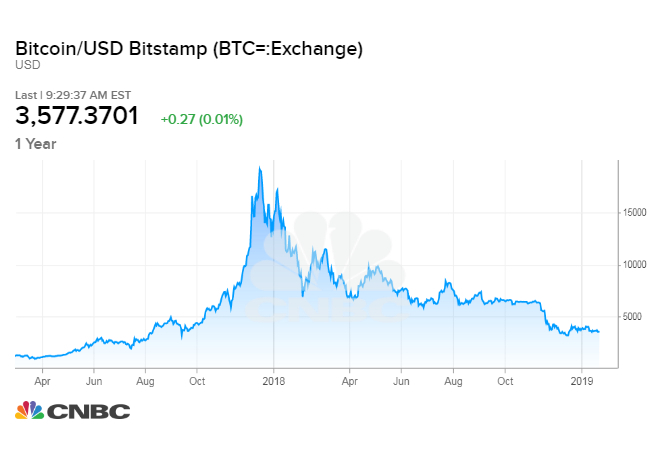 The bitcoin price bubble has burst but JP Morgan Chase's Jamie Dimon isn't taking a victory lap. The CEO was among the first and loudest on Wall Street to warn against the cryptocurrency, calling it a "fraud" and warning investors that if they were "stupid enough to buy it" they would "pay the price one day." When asked if he took any satisfaction in being right after bitcoin dropped 80 percent, Dimon told CNBC at the World Economic Forum in Davos he "didn't take any." Still, Dimon is advocating for its underlying technology, blockchain. Despite its own level of corporate hype, he said it's not the perfect fit to disrupt things like equity trades. It's a better replacement for certain online databases, he said. "Blockchain is a real technology — it's just a database we can all access that's kept up-to-date," Dimon told CNBC's Squawk Box. J.P. Morgan is using the technology, which gets rid of the need for a third party intermediary by creating a permanent, open record of all transactions on a network. Buyers and sellers can interact directly and have their exchange recorded on a what's known as a "distributed," or blockchain ledger. In October 2017, J.P. Morgan Chase announced a blockchain-based system that will "significantly reduce" the number of parties needed to verify global payments, reducing transaction times "from weeks to hours." Royal Bank of Canada and Australia and New Zealand Banking Group are among the bank's partners in the project. Corporate giants Amazon, Facebook, and IBM are among the many others exploring blockchain use cases. Bitcoin meanwhile has failed to stage a recovery. Since its peak in December 2017, the cryptocurrency has fallen 82 percent, according to data from CoinDesk. It has dropped roughly 75 percent over one year, and was trading near $3,570 on Wednesday.